Spring is quickly coming to an end and it’s time to take out your favorite sundress and those sandals that you love to wear to the beach. However, with your messy and overstuffed closet, it seems like your Summer clothes are all lost in a time warp! A simple solution would be to look at Space Age Closets. 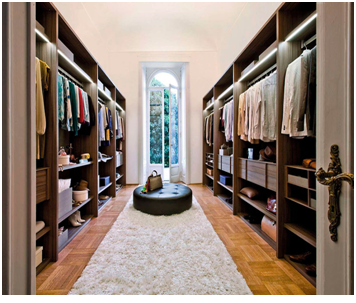 Toronto custom closets, so that your wardrobe is not only easy to find, but looks stunning as well. This design ensures that all your clothing items are both easy to see and dust-free, so that you will have no problem finding anything in the morning. Your shoes will last a lot longer if you keep them in a clean space rather than bunched up or in boxes. Place your winter boots and heels in a pull-out shoe rack or behind glass-fronted doors when you are not using them! This is the perfect place to put your favorite sweater, and your everyday purse and accessories. This way, your most worn items will be ready to grab when you are on the go. Need hanging space that will fit all your beautiful maxi dresses? The depth and height of all your panels can be easily customizable to your needs. To save space and time, we can design a pullout ironing board to a closet drawer. This way, it is easier to access and is out of the way when you are not using it. These keep your dirty clothes from ruining the aesthetic of your closet, and are easily accessible when it is time to do laundry, as they contain removable cloth bag inserts. We offer Toronto custom closets Space Age Closets that are compactly designed to fit your living space and individual needs. No matter the budget, we can help you create the wardrobe of your dreams.